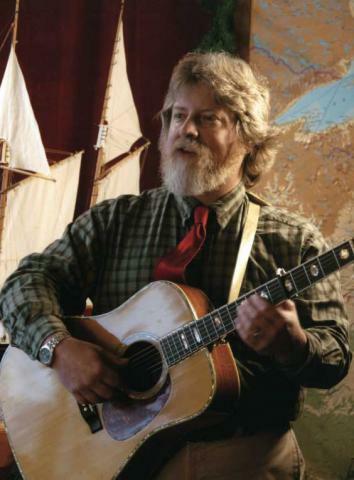 Lewistown, IL– Folksinger Lee Murdock brings back his vivid musical portraits of life on the Great Lakes and inland waterways to the Hickory Ridge Concert Series at Dickson Mounds Museum. Lee’s repertoire combines historical research and contemporary insights to create an anthem to the people who work, live and play along the freshwater highway. A highly acclaimed fingerstyle guitarist, Lee has a dozen recordings to his name. He has uncovered a boundless body of music and stories in the Great Lakes. There is an amazing timelessness in this music. Great Lakes songs are made of hard word, hard living, ships that go down and ships that come in. The music is grounded in the work song tradition, from the rugged days of lumberjacks and wooden sailing schooners. Murdock comes alongside with ballads of contemporary commerce and revelry in the grand folk style. Lee's fans have discovered a sweetwater treasure in his songs about the Great Lakes, finding drama and inspiration in the lives of sailors and fishermen, lighthouse keepers, ghosts, shipwrecks, outlaws and everyday heroes. The Hickory Ridge Concert Series is hosted by singer-songwriter Chris Vallillo. Concerts are held the 3rd Saturday of every month and begin at 7:00 p.m. with the doors opening at 6:00 p.m. Coffee, drinks, and a variety of desserts are available during intermission. There is an admission charge of $8.00 per adult and $5.00 for children under 12. The Dickson Mounds Branch of the Illinois State Museum is located between Lewistown and Havana off routes 78 and 97. For more information call 309/547-3721 or TDD 217/782-9175 or go to www.hickoryridgeconcerts.com.